photo post: alberta party policy conference. I attended this weekend’s Alberta Party conference in Red Deer and took some photos along the way. You can find more photos on Flickr. 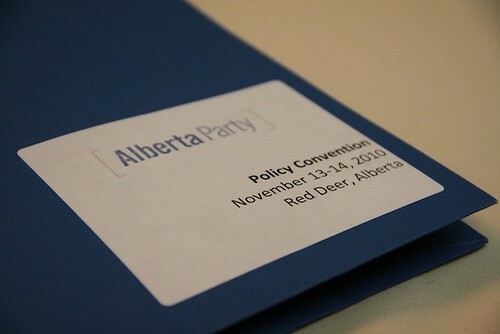 The participant package for the 2010 Alberta Party policy conference. 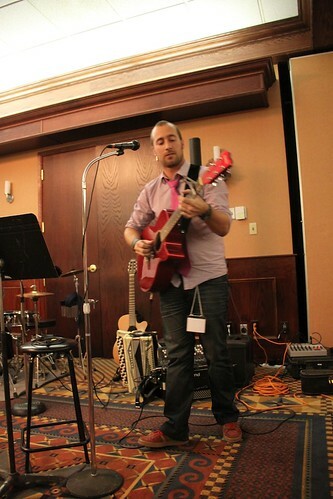 Alberta Party Chief Financial Officer Paul Ney was a rock star on Saturday night of the conference. About 150 people participated at the Alberta Party conference. 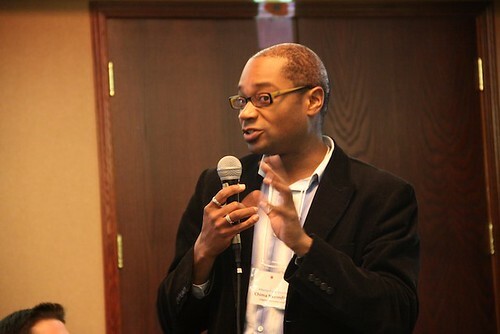 Alberta Party Board Member Chima Nkemdirim shared stories from his role as Campaign Director for Naheed Nenshi's successful Mayoral campaign in Calgary. 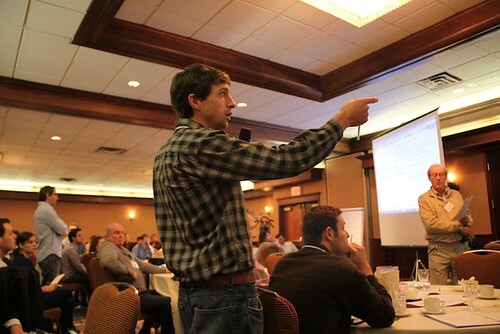 Almost all of the weekend's conference was taken up by debate and discussion about policy proposals. Grande Prairie Mayor Bill Given spoke to conference participants about his recent election. Alberta Party President Chris Labossiere votes during one of the many policy discussions. 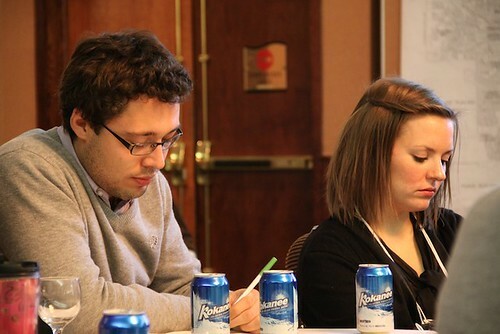 Alberta Party Board Members Josh Kjenner and Christel Hyshka were two of the key players in organizing the policy conference. 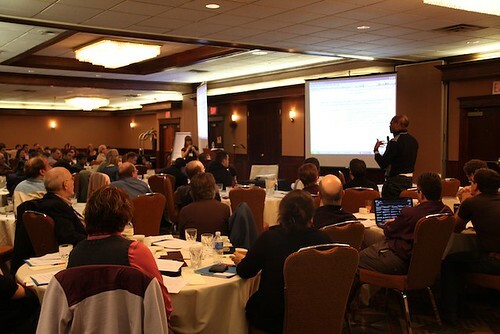 Participants discuss policy on the final day of the conference. This entry was posted in Alberta Politics and tagged Bill Given, Chima Nkemdirim, Chris Labossiere, Christel Hyshka, Josh Kjenner, Paul Ney on November 14, 2010 by Dave Cournoyer. live from red deer: alberta party policy conference. I am in the City of Red Deer this weekend attending the first policy conference of the new Alberta Party. About 150 people are participating at the conference, which is pretty good for a party that barely existed just a year ago. Energized by some of the results in the recent municipal elections, there is a sense of optimism in the air about this conference and the growth potential for this party. The policy debate sessions today have focused on the four most common themes identified in the Big Listen process: Environment, Democratic Renewal and Meaningful Citizen Engagement, Education, and Health Care. Some sessions have been more heated than others, but there has generally been a focus on collaboration and respect in the discussions. At the sessions I have attended, I sensed a mixed sense of caution and boldness among the participants, who understand that the decisions they make today will shape how this party will be perceived by Albertans. Some portions of the weekend conference will be live-streamed online, including a panel discussion this evening with Grande Prairie Mayor Bill Given and organizers from the campaign teams of Naheed Nenshi, Stephen Mandel, and Don Iveson. The panelists will be sharing some experiences and stories from the recent municipal election campaigns. I will be delivering the closing remarks for the conference tomorrow morning at 12:30pm, which you can watch online via live-stream (I will post the remarks on this blog afterwards). 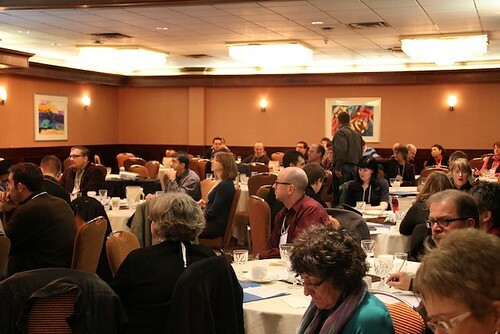 You can also follow the conference participants on Twitter at #abparty. This entry was posted in Alberta Politics and tagged Bill Given, Don Iveson, Naheed Nenshi, Stephen Mandel on November 13, 2010 by Dave Cournoyer. The upcoming Alberta Party policy conference in Red Deer is getting attention from the political class, including provincial Tories who are nervous about the links between the new party and Calgary Mayor Naheed Nenshi‘s campaign team. On the Saturday evening of the conference, Mayor Nenshi’s Campaign Director and Chief of Staff Chima Nkemdirim and campaign Communications Coordinator Richard Einarson will be participating in an political discussion panel (which will also include Mayor Stephen Mandel‘s Chief of Staff and Campaign Manager Patricia Mistuka, Councillor Don Iveson‘s campaign manager Chris Henderson, and the new Mayor of Grande Prairie Bill Given). 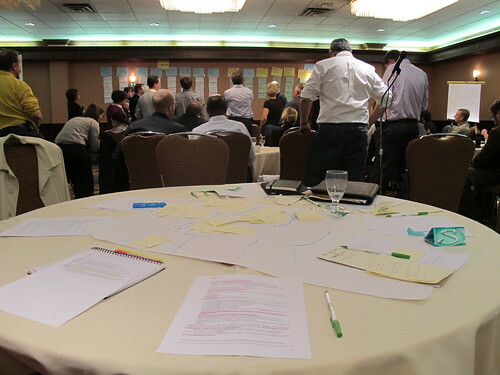 No room for good ideas? Proving that the current political climate in Alberta is not always friendly to thought-provoking ideas, Battle River-Wainwright PC MLA Doug Griffiths is feeling a lash back by the political establishment within his party and the opposition. 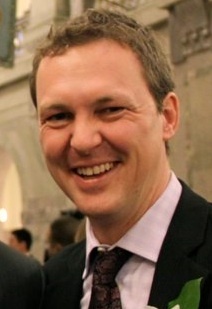 After trying to start a public discussion about how a provincial sales tax could reduce government dependency on natural resource revenue, Mr. Griffiths became the target of his own colleagues who shot down his idea at the recent PC Party convention and by the Wildrose Alliance, who have used Mr. Griffiths’ comments as a fundraising-focused attack campaign. Maybe it is something about Battle River-Wainwright, because this is not the first time an idea coming from that constituency was shot down by the political establishment. At the 2008 PC policy convention, that constituency association brought forward a motion supporting fixed elections dates. The motion passed at the policy convention and was soon after introduced as a private members bill (Bill 203: Election Statutes (Fixed Election Dates)) in the Assembly by St. Albert PC MLA Ken Allred. Mr. Allred’s private members bill was attacked by Olds-Didsbury-Three Hills PC MLA Richard Marz, who claimed that the creation of fixed election dates would allow public sector unions to schedule strikes near election dates (because as all Albertans know, it is those evil public sector Unions who have been standing in between the PC Party and majority governments for the past forty years… oh wait…). The fixed election dates bill was tabled to be discussed six months later. Two years later, the bill remains tabled and there is no sign that any debate will reassume. On a similar note, Edmonton-McClung PC MLA David Xiao hopes to start a discussion on mandatory voting in Alberta. While the idea probably has enough merit to deserve the opportunity to be debated and fully discussed, it is likely doomed to reach the waste bin of ideas to combat electoral disinterest. Edmonton-Centre MLA Laurie Blakeman released the Liberal Caucus environment policy yesterday, which includes a hard cap on greenhouse gas emissions by 2017 and a provincial groundwater inventory and water quality monitoring program. The fight over access to fresh water may be one of the next big fights on the political horizon as Premier Ed Stelmach has said that new water storage will need to be created in Southern Alberta to help increase industrial development. This entry was posted in Alberta Politics and tagged Bill Given, Chima Nkemdirim, Chris Henderson, David Xiao, Don Iveson, Doug Griffiths, Ed Stelmach, Ken Allred, Laurie Blakeman, Maude Barlow, Naheed Nenshi, Patricia Misutka, Richard Einarson, Richard Marz, Stephen Mandel on November 11, 2010 by Dave Cournoyer. alberta politics inside and outside the dome. Alberta’s Legislative Assembly resumes for Fall Sitting in a constantly changing political environment. As the leaves fall and winter approaches, so does the resumption of the venerable institution known as the Alberta Legislative Assembly. Much has changed since last year’s Fall Sitting in Edmonton. When MLAs return to the Assembly next Monday, they will have a few unfinished business to continue. The summer months have been far from quiet on Alberta’s political landscape. Premier Ed Stelmach has focused on promoting the oilsands to both audiences internationally and at home, including a tour with Hollywood Film Director James Cameron. 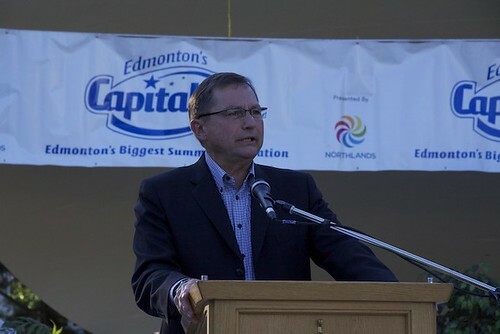 Premier Ed Stelmach at his Summer BBQ at the Alberta Legislature. There were three pieces of legislation that were left undealt with at the end of the Spring sitting. The Traffic Safety (Distracted Driving) Amendment Act, 2010 (Bill 16) which will ban the use of handheld mobile telephones while driving is back up and two private members Bills that may have little chance of reaching third reading. The Municipal Government (Local Access and Franchise Fees) Amendment Act, 2010 (Bill 203) and the Fiscal Responsibility (Spending Limit) Amendment Act, 2010 (Bill 204) are two private members bills that may have very little chance of reaching third reading. Bill 203 was introduced by Calgary-North Hill PC backbencher Kyle Fawcett, who recently had his knuckles rapped for boneheaded comments made over Twitter. 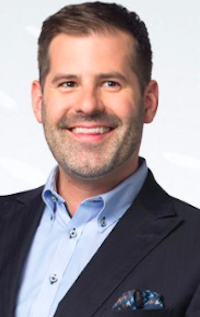 Bill 204 was introduced by Airdrie-Chestermere Wildrose MLA Rob Anderson and may be blocked from ever reaching third reading by the Tory majority in the Assembly. The Alberta Health Act will likely be the most contentious piece of legislation introduced in this sitting of the Assembly. Originally framed as a replacement for already existing pieces of health care legislation, the PC Government has since backed off after receiving an earful from Albertans in province-wide consultation meetings. The previously expected Alberta Health Act may be a shell of what it was envisioned to be when it is introduced in the next few weeks, but it could leave the door open for further legislative reforms (after the next election?). 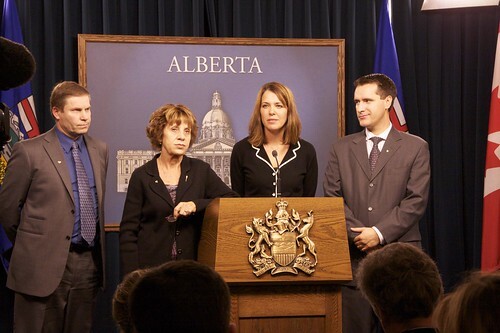 Wildrose Alliance MLAs Paul Hinman, Heather Forsyth, and Rob Anderson with their party leader Danielle Smith. I fully expect a continuation of the blood fued between the Wildrose Caucus and Assembly Speaker Ken Kowalski to continue over the next session. Since the Wildrose Caucus grew to three MLAs with the floor-crossing of Mr. Anderson and Calgary-Fish Creek MLA Heather Forsyth in January 2010, Speaker Kowalski has used his power on the Members’ Services Committee to block any further increases in funding to the now third party caucus (the two MLA NDP Caucus still receives more funding that the 3 MLA Wildrose Caucus) and even demand that Danielle Smith‘s name be removed from media releases. Fort McMurray-Wood Buffalo MLA Guy Boutilier joined the Wildrose Alliance Party in June 2010, but has remained as an Independent MLA in order to secure more research and communications funding (when he officially joins the Wildrose Caucus next week, their combined funding will decrease). Since last session, the Wildrose have declared war on Speaker Kowalski outside the Assembly by nominating Senator-in-Waiting Link Byfield as their candidate in Barrhead-Morinville-Westlock. Speaker Kowalski has represented variations of that constituency since 1979. Mr. Byfield has been endorsed by former Conservative Members of Parliament John Williams and David Chatters. Not to be outdone by the insurgent Wildrosers, the PC Party will be holding their Annual Convention in Calgary on October 29 and 30. I am told by a number of sources that the Convention will also serve as the kickoff for a series of “discussion sessions” with PC Party members billed as Speak Easies which will attempt to reconnect the party leadership with an increasingly disillusioned voter-base in the year before the party celebrates its fortieth year in government. 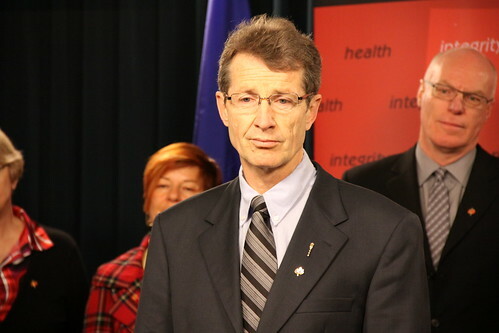 After a brutal Spring sitting that included the high-profile departure of Calgary-Currie MLA Dave Taylor from the Official Opposition Caucus, Liberal Opposition leader David Swann is looking to improve his party’s position this Fall. Dr. Swann is attempting to hitch his horse close to the Reboot Alberta group, which has attracted many partisan and non-partisan activists to its ranks during its two previous gatherings. In an email sent out today from his Calgary-Mountain View constituency office email, Dr. Swann implored his supporters to join him in attending the next Reboot Alberta meeting in Edmonton on November 5 and 6. 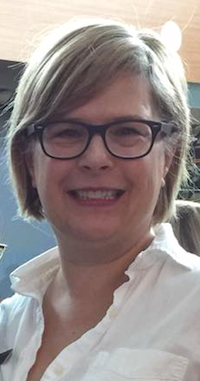 The NDP Caucus is probably feeling rightfully jubilant for the election of their Director of Research, Sarah Hoffman, to the Edmonton Public School Board, but those feeling of excitement may be tempered as they enter the Fall Sitting short-staffed. In early October, Communications Director Brookes Merritt left the NDP Caucus to accept a job with the Government of Alberta’s Public Affairs Bureau. Until they find a replacement, Chief of Staff Jim Gurnett is covering the Communications portfolio. 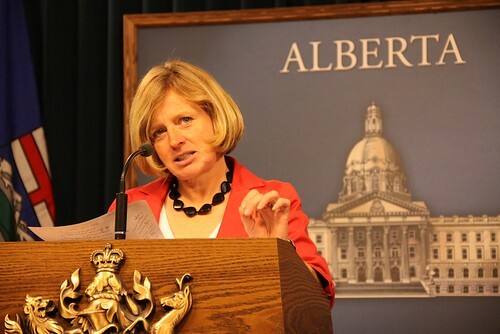 The NDP will be reporting tomorrow on the results of their province-wide “Earning your trust” tour that saw Edmonton-Strathcona MLA Rachel Notley and Edmonton-Highlands-Norwood MLA Brian Mason make summer policy announcements in a handful of cities across the province. The NDP will also be holding their annual convention in Red Deer on November 4, which will include British Columbia NDP leader Carole James as the keynote speaker (assuming that she is still leader on November 4). Outside the dome of the Assembly Building, there are some very real political changes happening. 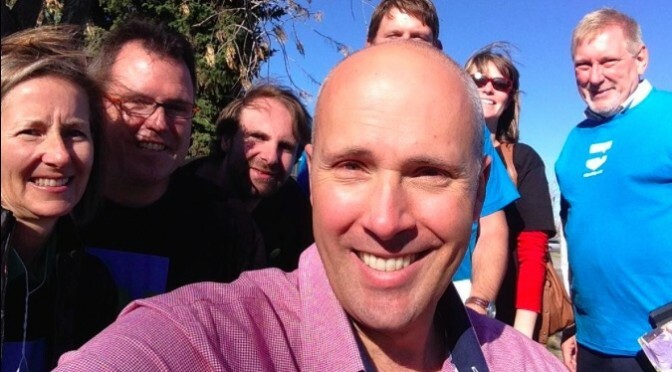 The new Alberta Party held its Annual General Meeting in Red Deer at the beginning of October and after months of touring the province holding Big Listen events, that party will hold their first policy convention in the same city on November 13. The Alberta Party Annual General Meeting. The new Alberta Party has also moved forward with the hiring of their provincial organizer Michael Walters. The party will also undoubtedly benefit from having many of its members involved in recent municipal election campaigns, including Alberta Party Vice-President Chima Nkemdirim, who was the Campaign Director for Naheed Nenshi’s successful Mayoral campaign in Calgary. Mr. Walters was also heavily involved in the Election Day get out the vote organization that helped get Mayor Stephen Mandel re-elected in Edmonton. Also not to be ignored is the role that the Wildrose Alliance played in recent municipal elections in the province’s two largest cities. The party has already hired organizers and been nominating candidates for the next provincial election, but leader Danielle Smith’s foray into the City Centre Airport issue in Edmonton and the Airport Tunnel issue in Calgary should not be ignored. Many Wildrose organizers active in the campaigns of Calgary Mayor candidate Ric McIver and Edmonton Mayor candidate David Dorward. While they may not walk away with voters lists, it is clear that they are taking advantage of any opportunity to get an organizational edge over the Progressive Conservatives in the next provincial election. A lot of attention has been paid to Mayor-elect Nenshi’s victory in the Calgary Mayoral contest (and rightfully so), but he was not the only new Mayor elected on October 18. Seven of Alberta’s medium sized municipalities also elected new Mayor’s this week. In the north west city of Grande Prairie, Bill Given unseated Mayor Dwight Logan. East of Edmonton, Linda Osinchuk unseated Mayor Cathy Olesen to become Mayor of Strathcona County, Rajko Dodic was elected as the new Mayor of Lethbridge. Along the Alberta-Saskatchewan boundary, Jeff Mulligan defeated incumbent Mayor Ken Baker in the City of Lloydminster. In the City of Wetaskiwin, Bill Elliot defeated incumbent Mayor Don Montgomery. In Airdrie, Peter Brown defeated incumbent Mayor Linda Bruce. In Alberta’s newest City, Steve Christie was elected Mayor of Lacombe, replacing the retiring Mayor Judy Gordon (who also served as the PC MLA for Lacombe-Stettler from 1993 to 2004). There was a lot of political change happening across Alberta on October 18, 2010. Of course, it is too soon to tell whether this will foreshadow a provincial election expected in March 2012. The Fall Sitting of Alberta’s Legislative Assembly will likely open with a low level of substantive legislation and legislative debate, but outside the Dome there will be no shortage of new characters and exciting politics. This entry was posted in Alberta Politics and tagged Bill Elliot, Bill Given, Brian Mason, Brookes Merritt, Cathy Olesen, Chima Nkemdirim, Danielle Smith, Dave Taylor, David Chatters, David Dorward, David Swann, Don Montgomery, Dwight Logan, Ed Stelmach, Fred Horne, Gene Zwozdesky, Heather Forsyth, James Cameron, Jeff Mulligan, Jim Gurnett, John Williams, Judy Gordon, Ken Baker, Ken Kowalski, Kevin Taft, Kyle Fawcett, Linda Bruce, Linda Osinchuk, Link Byfield, Michael Walters, Naheed Nenshi, Peter Brown, Rachel Notley, Rajko Dodic, Ric McIver, Rob Anderson, Sarah Hoffman, Stephen Mandel, Steve Christie on October 21, 2010 by Dave Cournoyer. edmonton election 2010: election night experience and hope for the future. As far as municipal elections in Alberta usually go, Monday night was a pretty exciting time to be a political person in this province. After a day of traveling across the City visiting campaign offices and gauging the energy of the difference campaigns, I made my first election night stop at Ward F Public School Board Trustee Michael Janz‘s election night party at the Boston Pizza on Whyte Avenue. I have known Michael for many years and was thrilled to watch the results consistently placing him ahead of his challengers Bev Sawyer and Joanna Rozmus. Michael and his team have worked hard and effectively ran a City Council-like campaign for the Public School Board seat, so it was a rewarding experience to watch their hard work pay off when he was declared elected with 53% of the vote. It was also great to see so many people celebrate Michael’s victory last night, including Edmonton-Riverview MLA Kevin Taft and Ward D Public School Trustee Dave Colburn, who both stopped by to offer their congratulations. At this point in the evening, word had begun to trickle in from our southern neighbours that Naheed Nenshi had taken the lead in Calgary’s Mayoral contest. Later that night, he would solidify his lead over Ric McIver and Barb Higgins and be elected Mayor of Calgary. Maybe it was the power of effectively using social media and word of mouth, but I did not talk with one person that night in Edmonton who had not heard about the Nenshi campaign over the previous 30 days. We had also heard that Bill Given had unseated Dwight Logan to become the youngest-ever Mayor of Grande Prairie and that Linda Osinchuk was on her way to unseating the popular Cathy Olesen as Mayor of Strathcona County. Following some hearty celebratory drinks, we grabbed a cab over to the Ward 10 Don Iveson election night party at the Parkallen Restaurant where celebrations were in full swing. Not only had Don just been re-elected to his second term on City Council, he also earned the highest percentage (76.3%) and highest vote total (12,945 votes) of any Councillor candidate running in this election. Don has done an excellent job on City Council over the past three years as a voice for both new ideas and prudent planning. Along with fellow Councillors like Ben Henderson, Don has been a strong advocate for smart transit planning and family-oriented infill in his three years on Council. After catching up with the crew at Team Iveson, we headed downtown to Mayor Stephen Mandel‘s election night party at the Sutton Place Hotel Ball Room. Mayor Mandel had been leading in the polls all night and by that point had settled into a 25% lead over second place challenger David Dorward. In the end, Mayor Mandel was re-elected with 55% of the vote, a stunning rebuke to the Envision Edmonton lobby group that had essentially labeled the Mayor everything but a terrorist for not supporting their invalid plebiscite petition a month earlier. The party at the Sutton Place was dying down by the time we arrived, but I still got the chance to chat with a few of the evenings successful candidates, including Councillor-elect Dave Loken who won a close race in the new Ward 3 and Councillor Henderson who was re-elected in the new Ward 8. It was a late night and overall it was a fun evening for party hopping. I am thrilled that Naheed Nenshi was elected Mayor of Calgary. His election victory has proved that you can win a Mayoral campaign by using full-sentences and presenting well-thought ideas. He will have a lot of challenges, including inheriting a dysfunctional City Council who do not owe him any allegiance, but not being an incumbent Councillor probably helped propel him into his election victory. I am sure that Premier Ed Stelmach is glad to be rid of his old rival, outgoing Mayor Dave Bronconnier, but Nenshi is no political slouch. In Edmonton, the clear mandate that Mayor Mandel has received in this re-election should mean the end of the Envision Edmonton lobby group’s crusade to keep the City Centre Airport open, but it will not. Not satisfied with the electoral defeat of their endorsed Mayoral candidate, the lobby group will be taking the City of Edmonton to court on February 10, 2011. I am generally pleased with how Edmonton’s City Council contests resulted. The potential for ideological contrarians like Kerry Diotte and Tony Caterina to cause havoc exists, but I believe that we may even have a stronger Council than the previous one, which could bode well in terms of cooperation and consensus building to move projects forward. I am also excited about the new faces on Edmonton’s Public School Board. 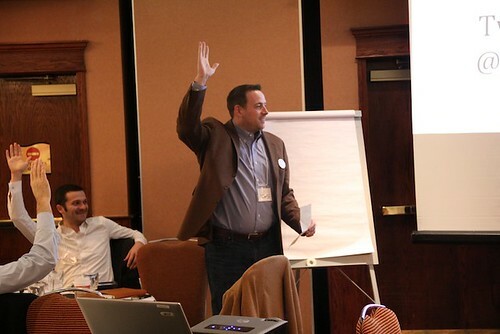 As I wrote last week, our Public Board was in desperate need for new blood and new ideas to help make the institution more relevant to the broader community. Now is time to make it happen. Monday was a good day for democracy in our province. I look forward t more good days to come. This entry was posted in Alberta Politics and tagged Barb Higgins, Ben Henderson, Bev Sawyer, Bill Given, Cathy Olesen, Dave Bronconnier, Dave Colburn, Dave Loken, David Dorward, Don Iveson, Dwight Logan, Ed Stelmach, Joanna Rozmus, Kevin Taft, Linda Osinchuk, Michael Janz, Naheed Nenshi, Ric McIver on October 20, 2010 by Dave Cournoyer. Election night victories for Naheed Nenshi, Don Iveson, Stephen Mandel, Bill Given, Michael Janz, and Sarah Hoffman, among many others. This entry was posted in Alberta Politics and tagged Bill Given, Don Iveson, Michael Janz, Naheed Nenshi, Sarah Hoffman, Stephen Mandel on October 19, 2010 by Dave Cournoyer. 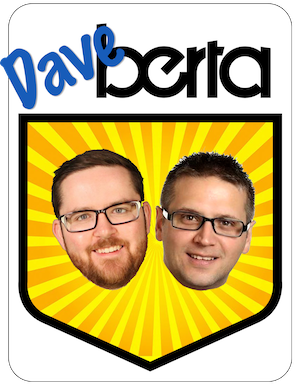 guest post: grande prairie election 2010. Grande Prairie: the flowers of democracy (campaign signs) are in full bloom in this northern city of just over 50,000. Grande Prairie is in for a relatively interesting civic election this year. There are five (5) candidates for the Mayor’s chair, and 14 candidates for the eight seats on council. The City of Grande Prairie has no wards, so all positions are elected “at large”. For this reason, the position of mayor does not have the unique influence it has in a city with a ward system, where only the mayor’s mandate is city-wide. In Grande Prairie, the mayor is just another vote on city council. On the other hand, the adjacent County of Grande Prairie No. 1 is going to have a very uninteresting election, as six of its nine divisions (including that of the current reeve, Everett McDonald) have been acclaimed. The issues? Well, of course, Grande Prairie isn’t Edmonton. For one thing, we only have one airport :-); and it’s within city limits. More seriously, foremost among the issues would have to be the cost of living, such as city taxes; quality of life; and relations with the province, including the effectiveness of city lobbying for the province to meet its responsibilities. The way I see it, there are two kinds of voters, and two kinds of municipal politicians, in this city (and most other smaller cities as well, I expect). There are those whose view of the city’s role is limited to paving the streets and paying for fire fighters, cops, etc. Then there are others who feel that a city must provide services and resources to increase the quality of life for its residents, especially if it is going to attract qualified professionals to teach in the schools and at the college, to work in the health care system, and generally to support the local economy. The first group wants taxes and spending held and even reduced; the second feels that revenue must be generated, and dollars expended, for the city to provide those resources and services. Here in the City of Grande Prairie, one of the complicating factors is that much of the most lucrative tax base is actually from industrial assessments outside its borders, in the County (full disclosure time: this writer has just moved into the County from the city, with the side benefit of lower property taxes than I would pay for the same home in the city), while much of the demand for services is located within city limits. If I were allowed to vote in this election, Given would have my vote for Mayor. Logan has just been around too long, and as for Blackmore … well, some months ago, my youngest daughter (then 19) was taking a course at the college, and had to attend a city council meeting for an assignment. She asked me to come along so she’d know what was going on. During the meeting, I was well-placed to see the computer screens of several of the aldermen, including Blackmore’s. She spent the entire evening playing solitaire! 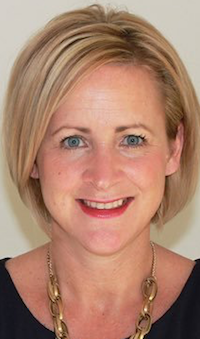 Now, maybe she is quite good at mental multi-tasking, and gave the matters being considered by council her full attention, but as a taxpayer, I was offended (my daughter was appalled). I was paying this woman $28,000 a year to play solitaire? I could play it myself for free. Out in the county, one potential issue arose too late to have an influence on this year’s campaign, and that is the decision by county council to terminate its fire service agreement with the city at the end of next year, and create its own composite (mixed volunteer and professional) fire service, effective Jan 2012, for the rural Grande Prairie area. This is of particular import for those residents (myself included) who live very close tho the city limits and within a scant 3-5 minutes from a city fire hall, and wonder about the response times and quality of service from a composite service. But the decision was announced a scant week and a half before Nomination Day, and so had little or no effect on whether potential council candidates stepped forward. Jerry MacDonald has been a Registered Nurse for 25 years and was educated in Halifax. Moved to Fort Vermilion, Alberta in 1985, and to Grande Prairie in 1988. Former UNA activist and local president at QEII Hospital (2003-2006). 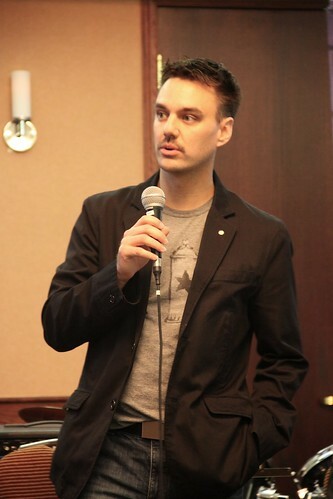 NDP candidate in 2004 provincial election (Grande Prairie-Wapiti); also worked on several other campaigns at both provincial and federal levels. Married to Nancy; three adult children. BSc in Nursing, post-RN (U of A 2010). This entry was posted in Grande Prairie Politics, Guest Post and tagged Alex Gustafson, Bill Given, Chris Warkentin, Dale Robertson, Dwight Logan, Elroy Deimert, Gladys Blackmore, Helen Rice, John Croken, Justin Munroe, Kevin McLean, Lorne Radbourne, Nasim Khan, Susan Thompson, Yad Minhas on September 30, 2010 by Dave Cournoyer.